Walleye are not known for being the strongest fighting fish, but getting the proper rod to catch them is still extremely important. They have one of the softest bites of any fish, which means it’s extremely hard to detect their strike. Having the best walleye fishing rod can help combat this problem and allow you to land more walleye! When angling for other types of fish, you can get away with an “off the shelf” rod gifted to you by your grandma. But for walleye, you want to get more in-depth in your rod search. Buying gear that’s not suited to the job can result in a less than optimal fishing experience that you’ll want to forget. Let’s make sure that doesn’t happen! While it’s true that there are a ton of rods on the market that can catch a walleye, we’ve narrowed it down to the top six we think are the best. Any of them would be a great addition to your fishing kit, and we think you’d especially love our top pick! KastKing WideEye Walleye Rod – Our Pick! 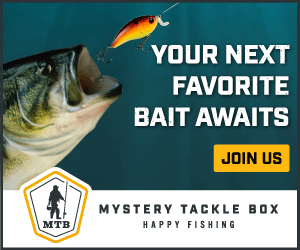 3.1 KastKing WideEye Walleye Rod – Our Pick! 4 Our Pick – the KastKing WideEye Walleye Rod! When choosing a walleye rod, you have to make sure it’s strong enough to land a large fish while being sensitive enough to allow you to feel their faint bites. The rod must also be powerful enough to set the hook firmly on the small bites, sinking the hook deep to ensure the fish doesn’t wriggle it out. The only exception to these rules is when you’re trolling. If you plan on trolling for walleye, the sensitivity will be less of an issue, and you’ll need a more powerful rod, as trolling puts a lot of strain and stress on your gear. Most rods don’t check off all of the criteria, but making the right compromises can be the difference between landing the fish and watching it swim away. Follow the guidelines below, and while we can’t guarantee you’ll never lose a fish, you’ll be much better equipped to ensure it doesn’t happen as often. The length of a walleye rod is not the most important thing, but it should be taken into consideration. Generally, we look for a rod in the six to six-and-a-half feet range. This is a great length to give you that nice fast tip, while still providing enough power to set the hook and land a decent sized walleye. Longer rods can be used if you’re trolling to give the rod a bit more strength, but for jigging or spinning, it’s not needed. When fishing for walleye, if you’re jigging, you want to look for a rod with a medium to medium light power. This will allow the rod to be lightweight enough to have a fast action, while giving it enough backbone to catch the fish. For a trolling rod, you want to look for a more powerful option. Look for one with a medium-heavy rating, which will give you enough strength to handle the rigors of trolling. Given the light bites that are characteristic of walleye, you’re going to want a very soft rod for better feel. Preferably, you’ll purchase a rod with a fast or very fast action if you’re jigging. If you plan on trolling, you can settle with the slightly stiffer fast rod, as the lesser action is not needed. This one comes down to your specific use case, so keep your fishing style in mind. The weight of the line is directly correlated to the rod’s power, so the more power you need, the higher line weight you’ll want to use. For general purpose walleye jigging, the range can be anywhere from four pounds to twelve pounds. 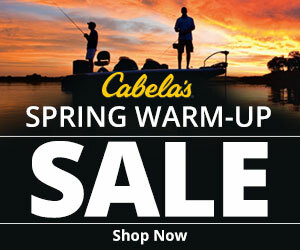 This range, combined with the proper power, will give you the best fishing experience when trying to land walleye. There are three main ways people fish for walleye: jigging, spinning, and trolling. The first two will use almost the same rod type, while trolling will require a bit of a more robust build. So, if you’re planning on jigging or spinning, your rod choice can be the same. However, if you’re looking to go trolling, you’ll need to think about getting a stronger rod. We gave you choices for each in our rod selection below, so that way you can make the proper buying decision. Check out our lure selection for walleyes! There are a lot of rods on the market that are made from less-than-optimal materials. You want to make sure you steer clear of them. You want to look for high-quality carbon or graphite, as well as a strong metal guide material. The handle material comes down to personal preference, but you need to be looking at either a high-quality EVA or cork build. Those materials are tried and true, and will help your rod to last for years to come. While the name KastKing may not be a well-known one, they’ve created what we believe is the perfect Walleye fishing rod. The WideEye Walleye Rod is a fantastic rod if you want to jig for walleye, and it’s sure to give you every advantage a rod can in your quest to land the big ones! With a length of 6 feet, 2 inches, it’s on the shorter side of what we like to see, but that makes it more portable and easier to handle. Combining short length with a stronger medium power and an extra fast action, this rod is amazing. It has the power to land even the largest walleye, and the action to feel even the smallest nibble. Being able to use a line weight between six and ten pounds is a great range, and the 1/8 to 1/2 ounce lure weight is a nice area for jigging for walleye. The ranges are a bit smaller than other rods, but you’ll find that most of the lures and lines you will use fall within this range, so it’s not a huge negative. The build quality is top-notch here, as well. Carbon layers intertwined with the graphite blanks create a solid structure while being extremely light-weight. Fuji guides and reel seats are also present, giving you the high-quality components you should be looking for. Overall, you won’t find a better rod for catching walleye than the KastKing. It simply outperforms the competition. Don’t let the name fool you: take the plunge if you want to catch as many walleye as possible. St. Croix is known for making high-end fishing rods that have all the bells and whistles. The Eyecon Spinning Rod is no different. It has some excellent attributes that you’d really appreciate on your next walleye fishing trip. Six feet, three inches is the perfect size for a walleye rod. The Eyecon also has a medium-light power and an extra fast tip. These two features combine to make a rod that’s strong enough to firmly set your hook, while being light enough to feel every bite. The medium-light power is a bit on the lower side of what we typically look for, but it should not pose any major problems. The Eyecon is rated for lines between four and eight pounds, which is certainly not the best range on this list. However, it’s good enough, considering the rod is only capable of safely handling lures up to 3/8 of an ounce. Neither of these are a wide enough range to wow us, and that’s why this rod didn’t get the top spot. The rod features a split EVA and cork grip which feels great in the hand. They used Kigan 3D guides which have strong aluminum oxide rings and ceramic inserts. The Fuji IPS reel seat is also a strong addition to this rod. As always, St. Croix has crafted a fantastic rod with the highest grade materials. While there are some flaws with this rod, it’s still a great option. Walleye fishing with this rod would be extremely fun, and satisfying for years to come. Rod manufacturers are always trying to innovate, but rarely do we see any breakthroughs in rod design. Fishing rods are already extremely well made, but somehow, Fenwick found a way to make their Elite Tech Walleye Spinning Rod even better. The rod features an innovative TAC and cork handle that doesn’t have the normal reel seat threads that are so uncomfortable. Instead, all you’ll feel is the comfortable materials no matter where you’re gripping the handle. The rod is extremely short at five feet and nine inches in length. If you’re looking for a shorter, more manageable rod, this could be a great choice. The power is medium, which is great, and the extra fast action pairs up nicely. A wide range on both the line weight and lure weight are great additions. You’ll be able to use lines from four to twelve pounds and lures weighing anywhere from 1/8 to 3/4 of an ounce. This means you can use practically any line or lure you want when getting ready for your fishing trip. To go along with that amazing handle, Fenwick uses high-quality carbon blanks and titanium guides. No expense was spared here on the build quality, and it really shows. This rod is a wonderful masterpiece of design. If you’re looking for cutting-edge technology, the Fenwick Elite Tech Walleye Spinning Rod is leading the pack. To get a rod to our specs, it’s only available in the smallest rod length, which is less than ideal (unless you are specifically looking for a short rod). Other than that, this rod is fantastic. Lure Weight: 1/8 – 3/4 oz. 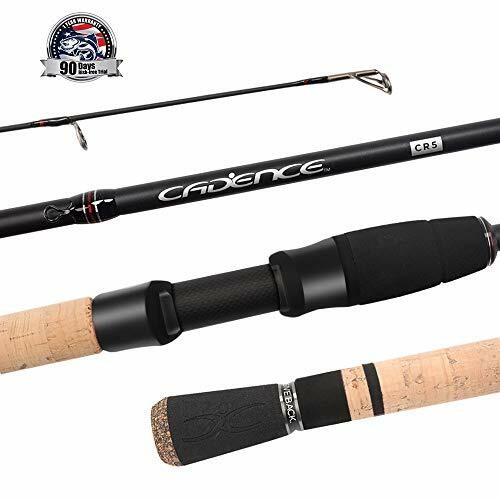 The Cadence Fishing CR5 Spinning Rod is a great all-purpose fishing rod. With this specific model, you’ll be able to use it for both jigging and trolling. If you’re looking for a rod you can use no matter the use case, this could be the one. Coming in at six-and-a-half feet, the CR5 is a great length for trolling, and well within range for jigging. Combine that with the medium power and fast action, it isn’t overly soft nor too stiff. That combination makes it a nice addition if you plan on using the rod in multiple fishing styles. With a nice wide range of six to twelve pounds on the line and 1/8 to 3/4 of an ounce for lures, you’ll be able to use almost any gear you want with this rod. This is another factor that makes it a great all-around rod for catching walleye. The build quality on the surface looks great: high-quality carbon, EVA and cork grips, and stainless steel guides with SiC inserts. However, in actuality, it doesn’t feel as mighty as other rods on this list. In use, it’s okay, but I’m not sure I would trust it as my main rod for years to come. The Cadence CR5 is a good rod. It’s capable of handling a variety of different fishing techniques, making it extremely versatile. The build quality, while looking great on paper, leaves a bit to be desired. 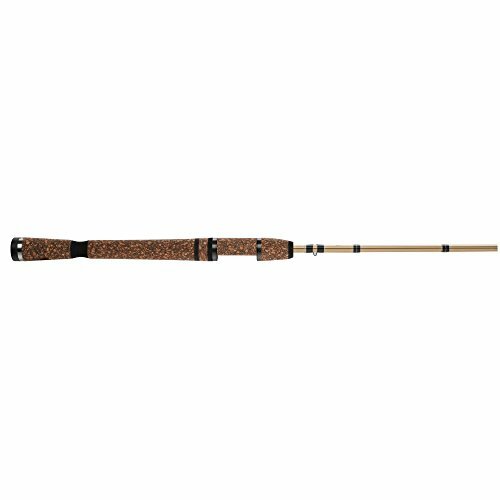 The second St. Croix rod on this list is the high-end Legend Tournament Walleye Spinning Rod. If you’re looking for the highest quality rod on this list, this very well could be it. Coming in at the “sweet spot” length of six feet, three inches, it’s going to handle well and be able to catch even the largest walleye in the lake. The medium power and extra fast action are great as well, making this rod handle like a dream. The line weight of this rod–six to ten pounds–could be limiting, which is worth nothing. The rod is only rated to handle a 1/2 ounce lure as well, and while not the worst, that’s not the best either. If you can look past these minor issues, there isn’t much else you can fault here. The build quality is exquisite. High-modulus graphite, Fuji guides with alconite rings, and machined aluminum wind check and trim pieces are just a few of the materials used to create the Legend Tournament Walleye Spinning Rod. 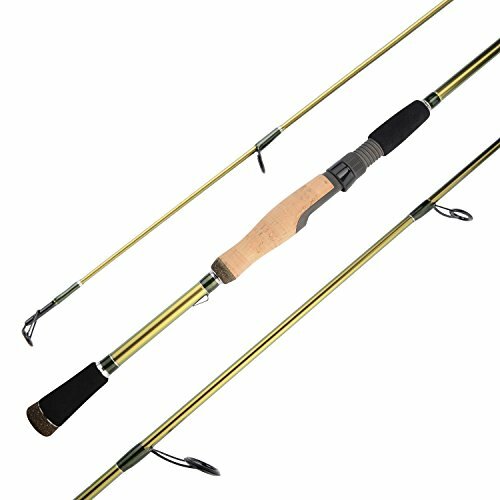 The feel and action on this rod are superb, and it features the nicest finish and materials of any rod on this list. If you’re looking for a premium walleye fishing experience, this rod wins hands-down. There are a few issues that prevent it from being the best walleye rod, but it most certainly is the most well made. If you’re not looking to go jigging for walleye, only trolling, the Tica Tactica XP WMVA Walleye Casting Rod is a great choice. It’s a more robust rod capable of handling the rigors of trolling, and less of a soft feel to ensure it has both stability and durability when trolling around. At over seven feet in length, this is by far the largest rod on this list. However, it’s needed for the medium heavy power and fast action it is equipped with. These are great attributes for a rod that will be used to troll for walleye, and thus, it has made this list. Using a line between ten and twenty pounds is optimal, and handling lures from 3/8 of an ounce and a full ounce, you’ll be able to troll with the largest of lures. The only limiting factor would be your imagination. The build quality of the Tica Tactica XP is where it fails a little. Crafted with 40 ton graphite and Fuji aconite ring guides, you’d think the great build quality would be excellent. The reel seat feels less than high quality, though, and the handle isn’t the most comfortable we have ever used. 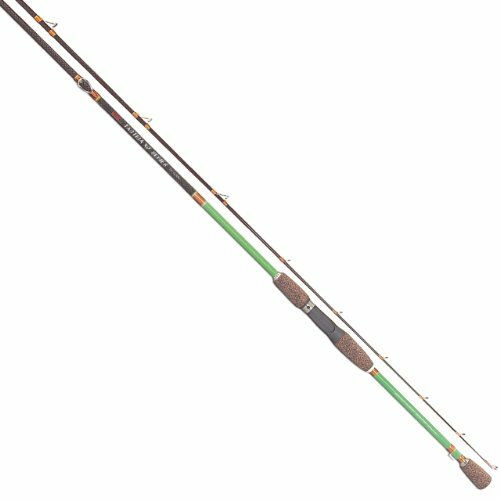 This rod is the least expensive on the list, and it shows in the build quality. The old adage “you get what you pay for” holds true here. However, the rod does what it does well. The longevity is the only question mark here. Our Pick – the KastKing WideEye Walleye Rod! Choosing the right rod for catching walleye takes a bit more research than most rods. It’s mainly dependent on the fishing style you’ll be employing. If you know you’ll be jigging, finding a rod with the right action, power, and build quality becomes easier. The same can be said for trolling. There are all-around options on the market (we even reviewed one above), and they can handle multiple fishing styles. However, you’ll generally find that you have to give up something for this convenience. We weren’t willing to sacrifice anything on our winning rod, thus the KastKing still takes the gold. There are many great walleye rods on the market, but we believe the best is the KastKing WideEye Walleye Rod. It does so much right that it’s hard to find anything to critique it for. We can’t recommend it enough.